Is Microsoft headed for disaster later this year when Windows 8 debuts on tablet devices some of which will not be able to run Windows 7 desktop apps, despite supporting an optional desktop interface? That’s what some critics are wondering after looking at another reportedly successful launch of Apple’s latest iPad and the comparatively lackluster popularity of competing slates such as the BlackBerry PlayBook, and a host of Android-based devices. The last, best hope for serious competition to the iPad, the argumentgoes, may come from Windows8 tablets sporting Microsoft’s new touch-friendly Metro-styleinterface. The problem is that Windows 8 tablets could confuse andfrustrate prospective tablet buyers. 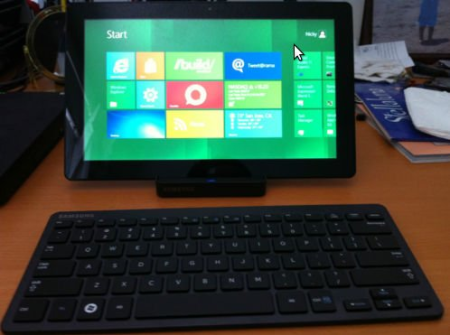 A Samsung Windows 8 tabletprototype given away at BUILD 2011 surfaced on eBay. A number of Windows8 tablets are expected to use ARM-based chips instead ofx86/x64 chips, which Windows typically relies on. These devices willcarry the Windows name but since they are ARM- and not x86/x64-basedthey won’t be backward compatible with any software that runs now onWindows 7. But Windowson Arm (WOA) tablets will still come with the Windowsdesktop. You’ll see the familiar Windows desktop, but you won’t be ableto download and run any of the legacy programs you’d expect. Meanwhile,x86/x64-based Windows 8 tablets, will be able to run anything thatworks on Windows 7 under Windows8. This could definitely cause chaos for the average person walking into aBest Buy and needing to learn the differences between legacy-friendlytablets and Metro-focused tablets using ARM chips. It’s not clear howMicrosoft and its partners plan to handle this issue, but they’ll needto make a simple differentiation between thetwo tablet types. One possibility would be to emphasize the touch-centric features of ARMtablets by calling them “Windows 8 To Go” or some other mobile-friendlymessage, while x86/x64 tablets might be called touch-enabled slate PCs. Microsoft could have avoided this issue by making ARM tabletsMetro-style only, but the company felt it was wiser to offer users theflexibility of choosing between Metro and the traditional desktopinstead. To show off that flexibility, the company plans to offerdesktopversions of Office 15 on WOA tablets. So unless x86/x64 tablets are headed for the enterprise market whereusing custom-built legacy software is a huge issue, marketing effortsfrom Microsoft and its partners may determine whether Metro-styletablets become a frustrating buying experience. Then again, this is only an issue if a large number of tablet buyersare looking to make heavy use of the Windows desktop. The traditionalWindows interface may be handy when you have to get work done in apinch or if you find a tablet powerful enough to replace your laptop.But given the popularity of the desktop-lacking iPad, the traditionalWindows interface may simply be a nice addition to Windows 8 tablets.Chances are most users will be more interested in using tablets forAngry Birds, Facebook, andFlipboard, than spreadsheets, presentations,and text documents.